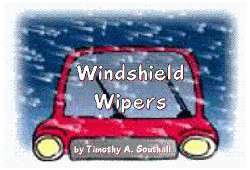 Did you ever think what it would be like to drive around in the pouring rain in a vehicle equipped with windshield wipers, but never use them? It doesn't make much sense, does it? Well, some of us do the same thing in our spiritual lives. With God's Word being available in so many forms and ways, we don't have an excuse for not reading it and becoming familiar with it. The Bible is God's love letter to us and His way of life for us. All we have to do is put it to use. If we don't put God's Word to use in our daily lives, it is like driving around in the pouring rain without using the windshield wipers. We are an accident waiting to happen–a hindrance to others–a danger to ourselves and others. We need to open our eyes and use God's Word to wipe away the things that our daily lives pour upon us. Utilizing God's Word will keep us moving forward in the right direction and get us to our destination–eternity with God. Just imagine what a wreck it would be if it isn't Jesus we see. Use your windshield wipers–use God's Word for direction in your life. Copyright © 2002 Timothy A. Southall. All rights reserved.